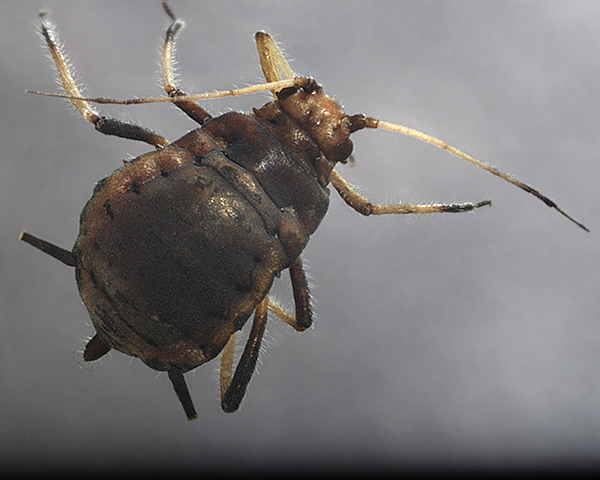 Adult apterae of Aphis epipactis are very dark green, almost sooty black, as in the first picture below. The terminal process of antennal segment VI is 2.7-2.9 times the length of its base. The femora and tibial hairs are much longer than the least width of the tibiae, making Aphis epipactis a member of the "long-haired black-aphis group", which includes Aphis ilicis and Aphis viburni. The siphunculi are 1.0-1.1 times the length of the cauda. The body length is 1.43-1.69 mm (estimated allowing for effects of dehydration on the type specimens). There are no satisfactory distinguishing characters from other members of the "long-haired black aphis group". 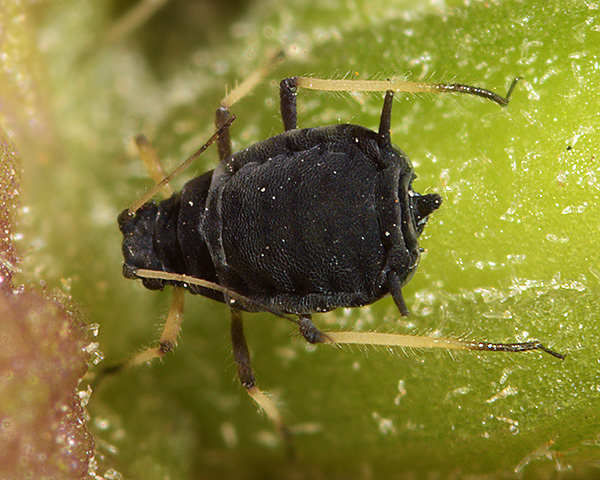 Aphis epipactis may well be synonymous with Aphis viburni, or possibly Aphis ilicis. The micrographs below show an adult Aphis epipactis dorsal and ventral in alcohol. If we accept Aphis epipactis is a valid species, it only feeds on helleborines, especially marsh helleborine (Epipactis palustris). If Aphis epipactis is instead Aphis viburni, which is using helleborines (Epipactis) as a summer host, then its winter host is Viburnum opulus. Sexual forms presumably develop in autumn. Aphis epipactis has been recorded in several counties in Britain and over most of Europe. We have only found the helleborine aphid on one occasion - on broad-leaved helleborine (Epipactis helleborine) in coniferous woodland (Abies) at Bedgebury Pinetum in Kent. 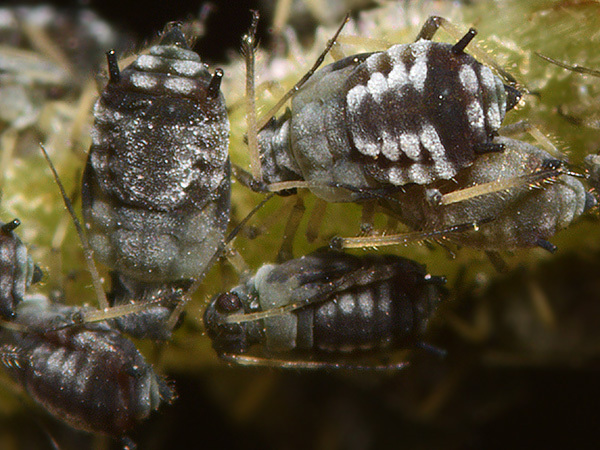 One plant was quite heavily infested with Aphis fabae-type black aphids. The adult aptera (see picture below) had the characteristic long femoral and tibial hairs of the "long-haired black aphis group" which includes Aphis epipactis. 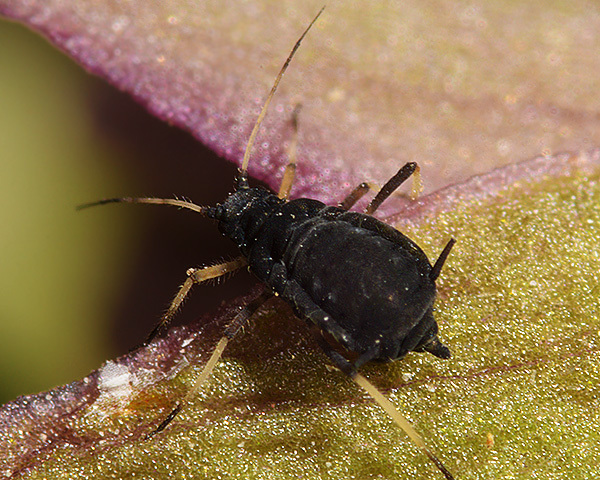 Jorg & Lampel (1995) were unable to include this species in their study of the Aphis fabae species-group but suggested that Aphis epipactis could be a strain of Aphis fabae mordwilkoi given that they had found it on the same host. 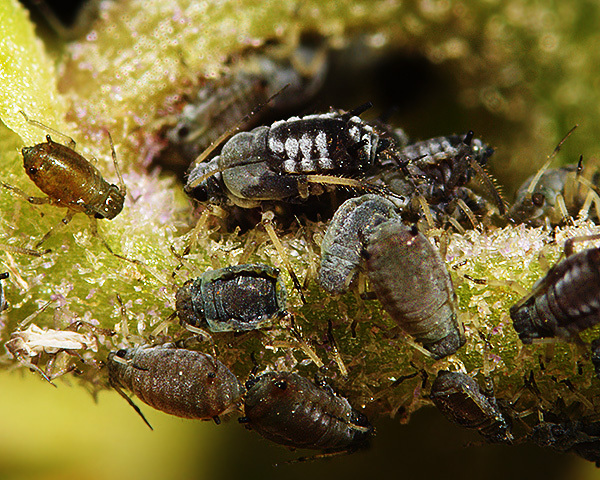 The younger instars were greenish-red and dusted with wax (see picture below). 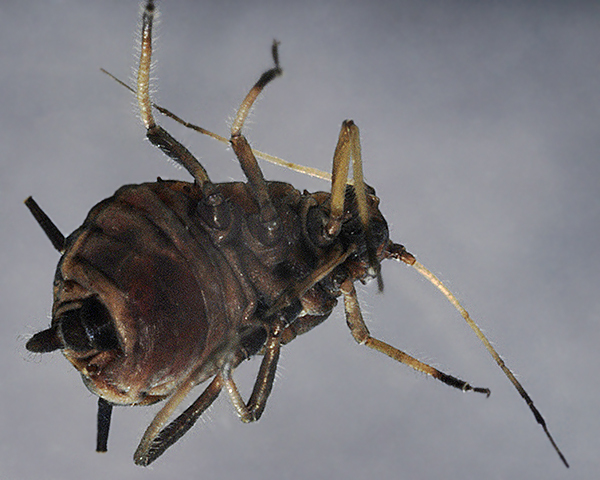 Wax deposits were especially heavy on the fourth instar of the future alate. The colonies we found were being rapidly consumed by syrphid larvae. 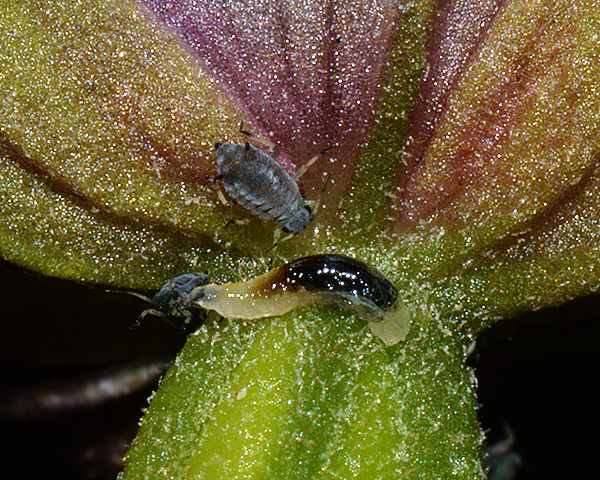 Blackman & Eastop list 6 species of aphid as feeding on helleborines (Epipactis) worldwide, and provide formal identification keys. We especially thank the UK Forestry Commission Bedgebury Pinetum for their kind assistance, and permission to sample. 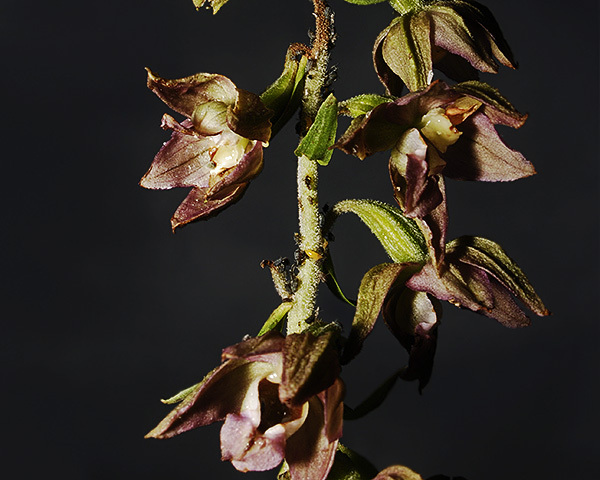 We also thank Alan Outen Bedfordshire Invertebrate Group for help unscrambling our helleborines.